Brookfield Estates is a 55+ community in Belvidere, New Jersey. This age-restricted neighborhood boasts numerous amenities to keep residents as physically and socially active as they'd like. Brookfield Estates is a single-family home community that offers the low-maintenance lifestyle sought by today's active adult homebuyer. Just around the corner homeowners will find everyday shopping needs and the world-renowned attractions of New York City are just a short drive away, making Brookfield Estates a highly desirable active adult community in Warren County, New Jersey. At the center of the community is a beautiful clubhouse. Indoors, residents will find an exercise room that provides everything they need to stay in great shape. Locker rooms are available for convenience and the sauna is a great place to relax after a workout. Brookfield Estates also provides several areas for socializing including a hobby and game room, ballroom, card room, and billiards room. A catering kitchen is also on hand for preparing a snack with friends. The terrific amenities continue outdoors with a pool and patio. Enjoying the warmer months is easy with bocce ball, tennis, and shuffleboard courts. Brookfield Estates also provides horseshoe pits and a putting green for practicing your short game. Walking and biking trails weave throughout the community and a picnic area is great for a casual get-together with friends. Brookfield Estates also allows you to say goodbye to expensive storage fees since there is an R.V. and boat parking lot available. Brookfield Estates was developed between 1999 and 2002. With 274 single-family homes, Brookfield Estates offers beautiful residences that range in size from approximately 1,275 to 1,920 square feet and have two or three bedrooms, two or three bathrooms, and an attached two-car garage. Residents love that some of these homes come with side-load garages, private outdoor spaces, hardwood floors, eat-in kitchens, gas fireplaces, and a three-season room. Homeowners will also have more time to do as they please thanks to the homeowners' association (HOA) fee. The HOA takes care of exterior maintenance and snow removal, giving every resident relief from tedious exterior chores. Living within Brookfield Estates means enjoying a low-maintenance lifestyle with like-minded neighbors. Homeowners can spend their time attending events in the clubhouse or joining a game of cards for an afternoon. Holiday parties are also great for meeting new neighbors. 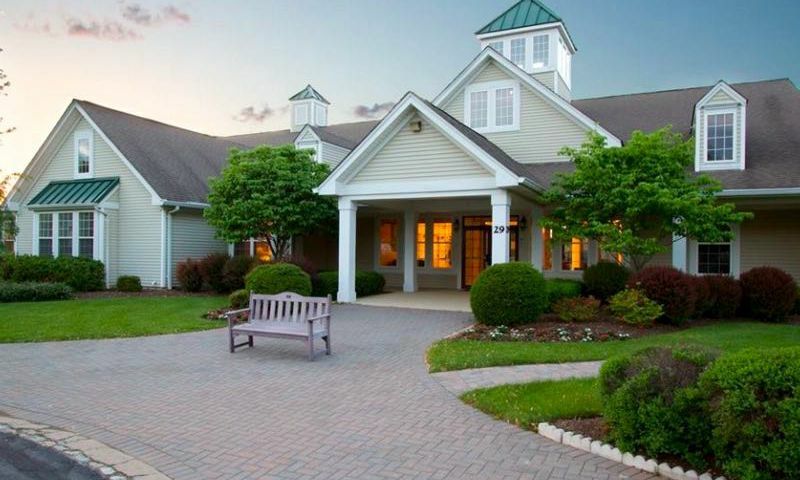 Residents regularly gather for games of tennis, shuffleboard, and horseshoes. No matter how you like to enjoy yourself, Brookfield Estates will have something for you. Brookfield Estates is located in Warren County, NJ. Just minutes from the Pennsylvania border, this community is also conveniently close to casual restaurants. Nearby Easton, Pennsylvania, which can be reached in less than a half hour, provides everything from grocery stores to restaurants to banks. Getting around the area is easy with Route 46 nearby. Brookfield Estates is approximately 26 miles from Lehigh Valley International Airport, making it very convenient to travel in the region or abroad. The Lopatcong Center Hospital is also just a short 15-minute drive away. Belvidere offers several options for recreation including the Furnace Lake Recreation Area, Buckhorn Creek, and the Delaware River. The town also has a winery and orchards for enjoying an afternoon outdoors. For big-city entertainment, New York City is about 70 miles from Brookfield Estates. Bethlehem is also just 26 miles from this 55+ community. Brookfield Estates is a great 55+ community in Northern New Jersey. There are plenty of activities available in Brookfield Estates. Here is a sample of some of the clubs, activities and classes offered here. Brookfield Estates was developed between 1999 and 2002. With 274 single-family homes, Brookfield Estates offers beautiful residences that range in size from approximately 1,275 to 1,920 square feet and have two or three bedrooms, two or three bathrooms, and an attached two-car garage. Residents love that some of these homes come with side-load garages, private outdoor spaces, hardwood floors, eat-in kitchens, gas fireplaces, and a three-season room. Please Note: Floor plans are not available at this time. 55places.com is not affiliated with the developer(s) or homeowners association of Brookfield Estates. The information you submit is distributed to a 55places.com Partner Agent, who is a licensed real estate agent. The information regarding Brookfield Estates has not been verified or approved by the developer or homeowners association. Please verify all information prior to purchasing. 55places.com is not responsible for any errors regarding the information displayed on this website.